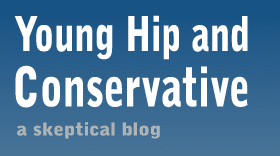 Young, Hip and Conservative: a skeptical blog: Is this naive? There's a lot of speculation that at one point, Chief Justice John Roberts was going to strike down the health care individual mandate, but switched sides at the last minute. There's some decent evidence that implies the dissenting opinion was originally written with victory in mind, but no solid information has come forward to explain what motivated Roberts to change his vote. I've heard theories about concern for his legacy, political pressure or even ninja assassins holding his family hostage. My theory is a little different. Maybe he changed his mind because he found the arguments compelling. Why is everyone taking this explanation off the table? The public speaks about the Supreme Court as if four of the members will automatically side the with left, and another four will automatically side with the right. Instead of revising that view and saying these are experienced legal scholars who have a firm grasp of the arguments and may put principals before party, they stand by their original view and say a mysterious unknown force changed the outcome. What if that unknown force was the power of a persuasive argument? Conservatives who automatically reject this explanation are in effect calling Roberts a political hack. Having now read the whole ruling, I get the impression that the ruling may just have been engineered to hand a real victory to no one and a small victory to everyone and in effect send it to congress to decide. I don't call it political hackdom to reject the baiting that both sides tried on the court. Most spectacularly Obama, but republicans tried it also.